We all enjoy a bit of ABBA in this house, especially Mamma Mia. Shaun & I've seen it live multiple times, back in Dallas. But the true Mamma Mia/ABBA fan is Faith. She has been obsessed with the music since she was about 4 years old. While most 4 year old little girls dream about princesses and going to Disneyland to meet them, our 4 year old knew all the words to "Does Your Mother Know That You're Out" and dreamed of going to Las Vegas so she could see the musical live on stage. For her sixth birthday, we surprised her with tickets to see Mamma Mia at Bass Performance Hall in Fort Worth, so her dream came true without us having to take her to Vegas. She saw it again, about a year and a half later, when the touring production came back to Dallas. And, she still wants to see it again. The movie gets a lot of play at our house. When the option to review ABBA You Can Dance came up, I knew I had to do it for Faith. The review option sounded like it was for a Girls' Night In or something like that, but anyone who knows my daughter, knows this one is for her! As well, I like ABBA's music. It is certainly better than a lot of today's pop music, and I don't mind that Faith knows all the words. The game did not disappoint at all. It features all the most important ABBA songs (according to Faith) which means it has the Mamma Mia soundtrack. Her favorites are Does Your Mother Know That You're Out (of course), Dancing Queen, and Mamma Mia, but she's also developed an affinity for Waterloo, thanks to the game. Despite it being featured at the end of the musical, she doesn't really consider it a part of the musical. But even better than just dancing along with ABBA music is singing along with ABBA music. This version of You Can Dance also features a karaoke mode. We don't have a microphone (yet), but that wasn't about to stop my diva from singing her heart out. 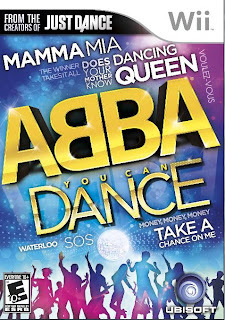 There is also a mini-musical mode, which features the opportunity to act in hour very own little ABBA musical, cmbing song and dance with a story onscreen. For your own little ABBA fans (or the big ones too), you can purchase ABBA You Can Dance on Amazon, for approximately $30, which can provides hours of entertainment for the little 70s dance stars in your life. Thank you to Ubisoft for sponsoring this blog post. Please click here to learn more about Ubisoft. I was selected for this sponsorship by the Clever Girls Collective. All opinions are my own. No compensation was received for this post, just a copy of the game to test.